Do you want to listen to your favorite music on multiple AirPlay™ compatible speakers at the same time? Even multiple songs in different rooms! Or do you want to mix your own sound-ambient? 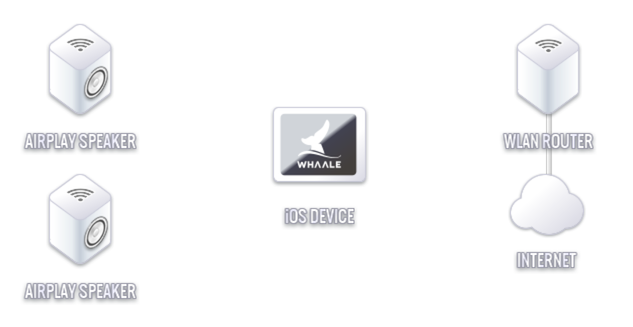 Then the WHAALE Multiroom Player App is all you need - NO additional Mac or PC is needed!!! For more information about AirPlay & multiroom audio please check out http://airplay-multiroom.whaale.com. The quick-start video gives you a smart overview about the main features of the app. It explains how to play music and how to adjust the speakers volume. More detailed information how to control the playback and how to regulate the volume can be found below. You are using multiple devices with WHAALE in your home? Then our 'WHAALE Family' feature might be interesting for you! WHAALE works with the „Now playing“ glance of the Apple Watch (WHAALE must be running + the setting 'Close app on other music app' must be enabled). If you have multiple playbacks on the stage, the "skip prev" button is used to select the playback. If the setting 'Master volume = device volume' is enabled, changing the volume via the watch changes the "master" volume. The app offers some settings that let you use it as a replacement for your kitchen radio that even your grand mother can handle (start/stop the app with one press of a button - even without the need to unlock the lock screen). Read here how to do it. You are tired of listening to monaural audio on your wireless AirPlay speakers? Then you can use 2 AirPlay speakers in one room to build a set of stereo speakers. You will find the setting under 'settings' -> 'Speaker settings' -> 'Names/Latency/Delay/Stereo' -> '...' -> 'Choose channel'. The items on the stage are too big or too small? Or you would like to use your own background image? No problem! Simply open the 'settings' dialog and change the 'Scaling' and 'Background image' settings. Answers to frequently asked questions may help you to proceed immediately. When I drag my speaker to the stage, it stays semi-transparent and I can not start playing music. What is wrong? The speaker is already in use: Please make sure the speaker is not being used by another player/application. On your iOS devices please make sure that the native AirPlay settings are using the iPad/iPod/iPhone setting. Password-protection: Make sure the speaker has not set a speakers password. WHAALE does not support password protected speakers, so it can not connect to it. We regard a speakers password as obsolete because all the speakers are in your local WLAN (which is protected via encryption), consequently the speakers can not be abused by a third party. 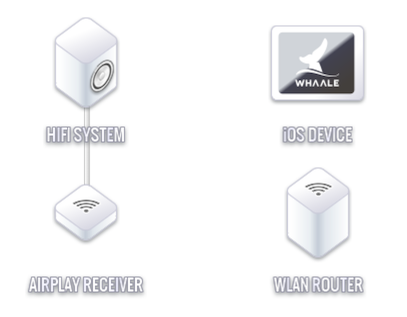 Speaker is not supported: By supporting the AirPlay™ protocol, the WHAALE Multiroom Player recognizes all AirPlay™ compatible speakers in your network. The music is not 'in sync' on my speakers. It sounds like some kind of echo. This usually happens with Apple TVs connected to a TV set or an AV receiver. For this purpose the possibility to adjust the speakers latency is included. The settings now show a list of your AirPlay speakers and gives you the possibility to adjust their latency. Play around with the settings until you hear the song playing in sync on all speakers. This process only has to be done once - the settings will be stored permanently. These settings will only adjust the way our app sends the music to the speakers - so no speaker settings are changed (it will have no influence on other apps/applications). Please use the feedback functionality to share your experiences - so that we can include it in the FAQ! There are dropouts while playing the music. What is going wrong? Generally only a WLAN-router is recommended which supports at least 802.11n or 802.11ac standard (up to 150/300 MBit/s and more). A dual-band-router (2.4 and 5.0 GHz) can be used for separation (2.4 GHz-band 'normal traffic / internet' and 5.0 GHz-band only 'WHAALE for speaker-supply'). Please have a look at our recommendations which show various ways to set up and configure your WLAN to work smoothly with WHAALE. Here is a good article how to solve network problems in general. As a first step, please open the "settings" and go to "speaker settings". Please enable the setting "compress audio" and see if that solves/improves the issues. In your neighborhood there is another WiFi network operating on the same channel. In the WiFi routers configuration choose another channel by hand and see if that helps stabilizing the music playback. One or multiple of your Airplay devices have a bad WiFi signal and miss audio packages. They ask for a „resend“ of the package. If that happens to often, you will hear dropouts or speakers will disconnect completely. Position all of your Airplay devices as near as possible to the WiFi router. Play music on each of the devices exclusively using the WHAALE app and see if that works for 2-5min without interruptions. If that works, try to use multiple devices at the same time. If that works, position the devices at their original location one after another - can you find a device/location that is causing the problems? Sometimes metal structures like steel beems or even cookie jars can cause problems with wireless networks. In that case, try to position the device in another location and check if that works. I have bought a new iOS device. How is it possible to take over my completed In-App-Purchases (IAP) without paying again? Open the WHAALE Multiroom Player and navigate there to the shop. On the lower screen edge you find the button RESTORE. Click on it and identify yourself with your Apple-ID. In case you have done any IAP under your Apple-ID you have access to it on your new iPad immediately. I have upgraded to three or more speakers but the dollar-sign is still there. Sometimes the buying of additional speakers is not confirmed but you have already paid for this via in-app-purchase. To get advantage of your new speakers just visit the WHAALE shop again (tap to the dollar-sign on a speaker or flip to the most right menu and tap to 'Shop'). On the bottom of the shop you will find the 'RESTORE' button. Just push it (maybe you have to confirm with your apple id) and your bought speakers will be there. To make sure the purchases are stored, please stop all playbacks and press the home-button to close the app. After relaunching it, all speakers should still be there. How can I add further AirPlay loudspeakers? 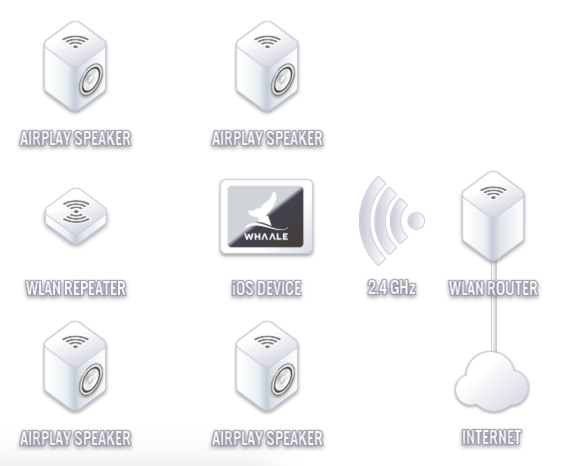 The WHAALE Multiroom Player locates all AirPlay™ compatible speakers that are available in your WLAN. Make sure that the AirPlay™ speaker is configured properly and is in the same WLAN as your iPad. If your speaker is still not visible, you should check if the speaker is visible in the iPad specified 'Music-Application'. If not, you can try to deactivate the WLAN in your iOS settings and reactivate it afterwards. This time your speaker should be available. If not, you should check the configuration of the speaker using the tools offered by its vendor. Why does WHAALE react with a delay, for instance while using PLAY/PAUSE or SKIP? The wireless transmission of the sound to the speakers is based on the AirPlay™ protocol. The protocol defines a buffer of 2 seconds to be able to deal with short network dropouts during high-load network situations. This helps to give you a seamless and high-quality sound experience. In order to overcome this 2 seconds latency, we synchronized our user-interface (the dancing of the playbacks on the stage, the gravity-effect) with the actual sound, introduced the "ghost" coin and additional animations when switching the playback states. I would like to listen to music through my iPad-speakers/headset-output as well. What shall I do? If no AirPlay speakers are connected, the hardware output of your iOS device becomes active. Now you are also able to listening via headphones or bluetooth in your car radio. I would like to use my own hi-fi set and do not want to buy AirPlay™ speakers. What shall I do? There are a couple of AirPlay™ compatible hi-fi sets / AV receivers on the market. If you own one of them, the WHAALE Multiroom Player will recognize it as an AirPlay™ compatible speaker. If your hi-fi set is not AirPlay™ compatible, we suggest that you buy an additional AirPlay™ receiver (for example an AirPort Express station or Apple TV). This is recognized by the WHAALE App as AirPlay™ speaker and can be connected to your hi-fi set via 3.5mm mini jack or optical cable. We strongly recommend using an AirPort Express device for this task - see http://airplay-multiroom.whaale.com (section "The infrastructure") for more information. Are Bluetooth and other DLNA-capable speakers supported? No. Neither Bluetooth nor DLNA support synchronizing the speakers in order to have a perfect multiroom experience. Please read our article at http://airplay-multiroom.whaale.com for details. The 'Network overload' sign flushes every time if the bandwidth in your WLAN network is too low to send all audio data in time. Maybe this occur along with dropouts in your music. Regarding to your requirements we have some experiences in optimal configuration of your WLAN network. The most common setup at home is adding your AirPlay™ speakers to your existing WLAN. All devices in your environment are connected to the same WLAN and share its bandwidth. If there are a lot of other devices in your WLAN (e.g. laptops, personal computers, smart phones, backup hard disks, etc.) they produce many traffic? In this case it would be smart to divide the common internet/network from the WHAALE sound traffic. Up to the 802.11n (or 802.11ac) standard WLAN routers provide two bands of frequencies, 2.4 GHz and 5.0 GHz. If you are an owner of a large house/flat with many rooms and big walls? 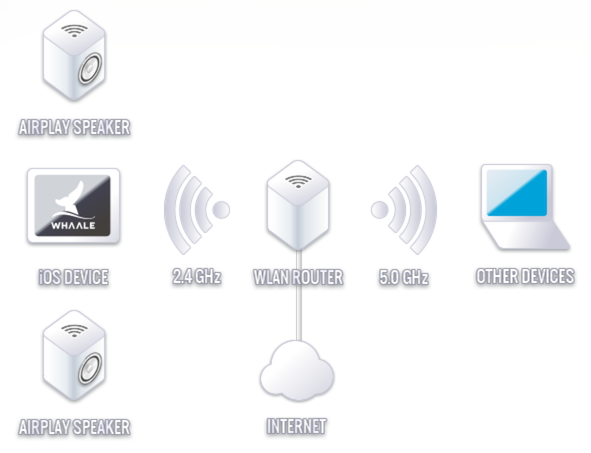 If your AirPlay™ speakers are far away from your WLAN router (e.g. terrace, garden)? We recommend to refresh your WLAN if you have some dropouts in your music playing. You should combine this picture with a dual-band router, see above. If your hi-fi set is not AirPlay™ compatible, we suggest that you buy an additional AirPlay™ receiver. This is recognized by the WHAALE App as AirPlay™ speaker and can be connected to your hi-fi set via 3.5mm mini jack or optical cable. We strongly recommend using an 'Apple AirPort Express' device for this task - see http://airplay-multiroom.whaale.com (section "The infrastructure") for more information. This topic has moved to here.